Target audience: Brides and grooms, potential brides, friends, family members, mother of the bride, mother of the groom, grandparents, aunts, and cousins of the bride. 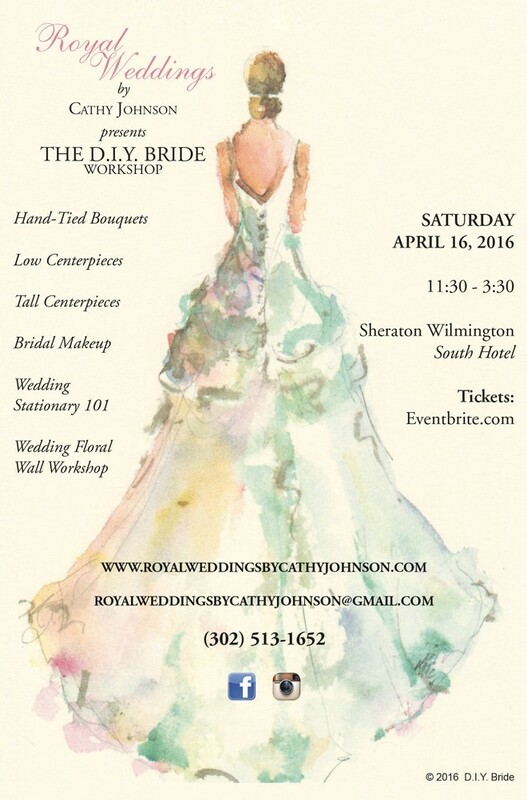 When: Saturday April 16, 2016 11:30 to 3:30 P.M.
What it is: A collection of mini workshops where the bride, or anyone interested in learning, will participate in the “hands-on” construction of hand tied bouquets, low centerpieces and tall centerpieces. They will also learn the best way to prepare and maintain flowers, source the freshest flowers and where to obtain affordable supplies and high quality materials. Other workshops may include wedding stationary 101, wedding day makeup, what to know when choosing a wedding cake, understanding venue contracts, the art of buying a wedding dress, and much more. Participants will also have the opportunity to interact with vendors, view table settings and special order linen, as well as other wedding and event related activities. In addition, for $75, couples can take “on the spot” couple/engagement photos which includes a makeup application, mini photo shoot, and a picture which can be uploaded on wedding websites or used for save-the-date cards. Who will be there: Various workshop instructors from the industry, vendors, and possibly popular social media personalities. How and Why it is important: The wedding industry has become a multi-billion dollar business. However, some of the best-kept secrets of planning and executing an event have remained elusive to those who don’t have a blank check to pay for the ever-increasing cost of a wedding. The D.I.Y. workshop series offers an opportunity for brides to learn the skills needed to create the wedding of their dreams, access quality products, and learn industry secrets that will elevate their event to the next level. ← Previous Story Anderson Travel Services, Inc.